Oh Snap! The Friggin Amazing J.Ho Sketchblog...: That Dude is a Beast, Man! The action pose is decent. Maybe some of the forshortening is bothering u? The scales seem to shift. It doesn't bother me. All in all not ur best effort but still amazing. If you ever get tired of drawing fantasy creatures (on 3... 1... 2... 3: BWAAAHAHAHAHAHA!!!!) pick up an anatomy book and just do mindless life drawings. I wanna see sketchy boobies. thanks for the crits man. i actually prefer the sketchiness of this one over mer-man and tri-klops, but oh well. life-drawing: yeah, i should... but then again, life drawing is for artists--i'm just a dork with a pen and a scanner! u should next draw Tundro! Well, once again I seem to have had commenting problems. I think I probably shouldn't try to leave comments when I'm at work, there's probably some weird firewall or bandwidth thing going on there. So, let me attempt to remember what I said. Basically nice Beast Man. I like the sketchiness here, it seems to go with his personality. I thought for a second that I remembered an energy whip in the cartoon but I was probably thinking of Blade's whip. At any rate, it works. As for the coloring, I think it's great. It's kinda funny. When I got Moss man I stripped him (that's right stripped him) of his gear or reignments if you will, (I didn't want him just looking like the repainted Beastman mold that he is) and I swapped Beast Man's pads for the one's that came with his fuzzy green counterpart because I liked the contrast. I also think the black straps are a nice little touch too. Okay, I'm done. anonymous: if you think i'd just draw tundro, you're crazy. if you think i'd draw tundro AND the rest of the herculoids, you'd be right--they're on the list, but i make no promises about when you'll see them! Jamilyn: if i recall correctly, moss man did not come with any accessories besides his mace. i think perhaps you are thinking of the extra set of beast man armor that came in the "Masters of the Universe Weapons Pack." 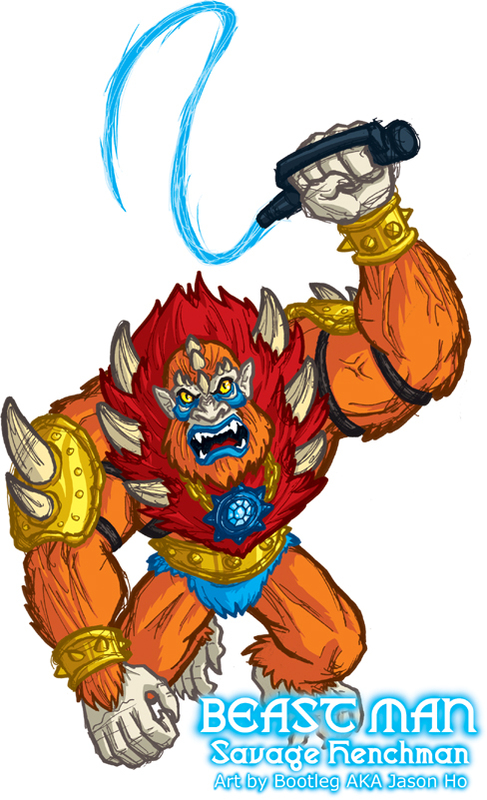 From the photo it looks like that set of armor is more orange than yellow--when i chose to color beastman's armpads gold, i was doing so to match his gold belt.